College Guidance Officer Mrs. Foley and Montrose Juniors with Dr. Jim O'Connell, BHCHP President. 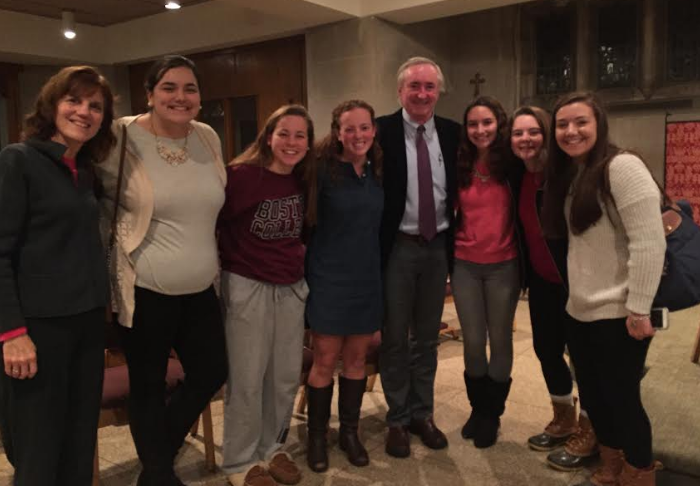 On Thursday, October 6, St. Ignatius Church hosted a program to interview Dr. O’Connell about Stories from the Shadows, to which Guidance Counselor Mrs. Foley brought a group of Montrose girls. The lower level of the church was filled with people of all ages. As the program began, I sat with five other juniors: Hannah Marino, Sophia Sardegna, Maggie MacIsaac, Olivia Goughan, and Olivia Hastie. The program had two main parts: an interview with Dr. O’Connell, and a question-and-answer portion. Afterwards, his book was available to purchase. Dr. O’Connell shared fascinating insights throughout the interview. He told the audience about his circuitous route to the medical field. After graduating from Notre Dame in 1970 and receiving a high draft lottery number that kept him out of Vietnam, he studied philosophy and theology in England, taught high school in Hawaii, and pursued a doctorate with political theorist Hannah Arendt in New York. Later, during a trip to the Isle of Man, he encountered a biker who had been injured in a motorcycle accident. Comforting the biker during his suffering transformed Dr. O’Connell. He found his calling. At 30, he entered Harvard Medical School. After a three-year residency in internal medicine at Massachusetts General Hospital, Dr. O’Connell joined the staff at the Nurses’ Clinic at Pine Street Inn. He initially intended to stay for one year, then move on. However, his plans soon changed. Captivated by the complexity of the homeless of Boston, he needed at least another year with the organization. One year turned into 30. Dr. O’Connell helped found and now serves as President of BHCHP. “During the first two months, I soaked feet at the clinic and talked to the people,” Dr. O’Connell shared. He added that the nurses in charge wanted him to be not an imposing doctor, but a humble servant of others. Dr. O’Connell said that when he first arrived, he was far from humble. Serving the homeless in this way—literally, at their feet—gave him a different perspective on the true spirit of service that BHCHP embodies. Dr. O’Connell ended with an anecdote from his early years at BHCHP. He recalled one nurse telling him, “This has to be about social justice, not about charity. Charity is scraps from the table. Social justice is a seat at the table.” Dr. O’Connell truly embodies this spirit of social justice throughout his everyday work with the people on the streets. Thank you, Mrs. Foley, for sharing this opportunity with Montrosians!